Did you guys eat Fudge Stripe cookies as kids? Did you pop them onto your finger and casually eat them around the edges? I totally did. So these are a total memory! And an accessory! And they look so good in stripes. These taste just like the Keebler guys. And since I live in an upper flat, I’m basically baking these in a tree, right? So if you ever crave these store-bought beauties, just make them! And when you’re snacking on them you’ll totally feel like a kid at a church picnic or at your Aunt’s house, but mostly you’ll just feel like a kid spinning around with a cookie on your finger. Preheat oven to 35o°F. Line baking sheets with parchment paper. Combine the flour and baking soda in the bowl of an electric mixer and stir briefly. Add in the corn syrup, oil or butter, and vanilla. Mix until a dough comes together. Form into a disc, wrap in plastic and chill for 10-15 minutes. Roll out the dough on a lightly floured surface to about a 1/4-inch thickness. 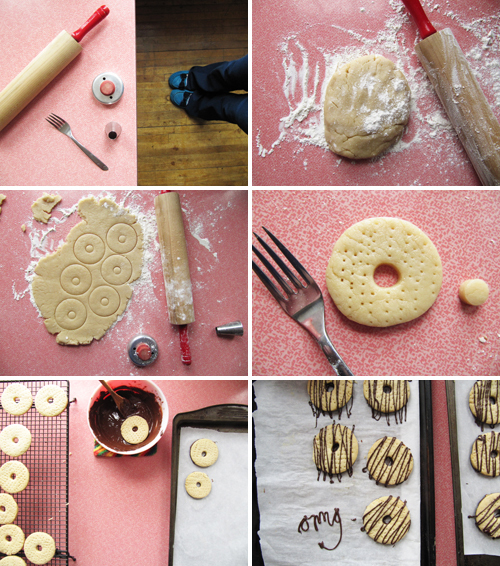 Cut out using a 2 1/2 inch round cookie cutter and a tiny round cutter or pastry tip to cut a small hole in the center. Poke lightly with the tines of a fork. Reroll dough scraps cutting out more cookies until dough is all used up. Bake until just barely browned 7-9 minutes. Transfer cookies to a cooling rack to cool completely. When cookies are completely cool, melt the chocolate in a heatproof bowl set a few inches over a pot of simmering water. One at a time dip the bottom of each cookie lightly in the melted chocolate so that is covered in a thin layer. Transfer back to parchment-lined baking sheets to set. 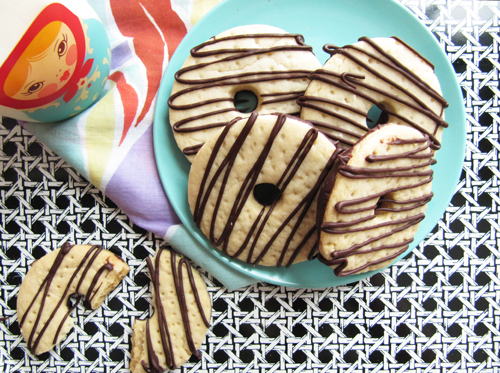 Use the remaining chocolate to create a thin striped pattern over the surface of the cookies. Using a plastic bag it a teeny corner cut out works fabulously. Chill in the fridge until chocolate sets. 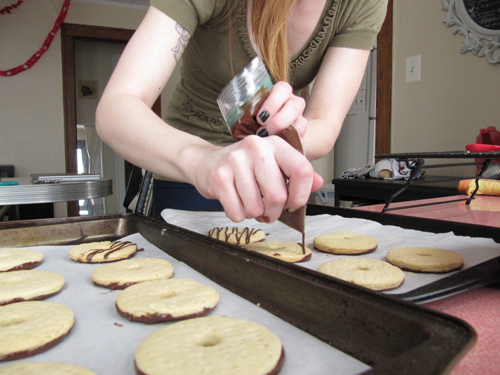 Cookie striping and my super-tan arms. I love that you made these tree-house treats! I never did like the store-bought guys, I always felt the fudge was waxy…but I bet these are way better! I love that you were classy with your chocolate love since you were a kid! I bet you’d totally like these better. 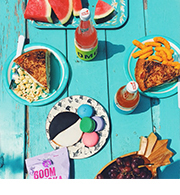 I see these cookies in my near future… I also want to plan a trip to your tree house. 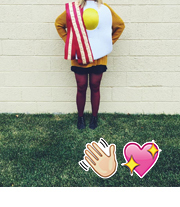 Megan, I love that you made these! Do you remember that they were one of your brothers favorite? I wondered if you used to eat these at Aunties..and if she told you she made them..just like she did the Oreo’s? They look great 🙂 . So glad you enjoyed these. Yours look great! THESE ARE SO SMART. And cute. I loved these as a kid, yet never thought to make them. In love. <3 They love you back! Oh my gosh, I love it! 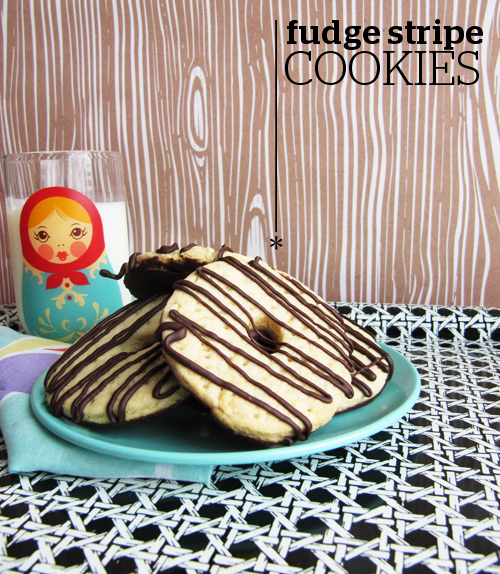 Yummy fudge stripe cookies! And I love the whole setup! I haven’t had a fudge stripe cookie in forever, but I used to love them! Of course I ate them off of my finger 🙂 I’m sure your homemade version is as tasty as they are cute! Your babushka doll glass is super cute!